President Buhari on Tuesday met monarchs in Ekiti and sought their support for his re-election bid ahead of the forthcoming general elections. Buhari met with the traditional rulers at the Government House in Ado Ekiti, where he sought their support for his government to guarantee peace in the country. Former Minister of State for Defence, Sen. Musiliu Obanikoro, on Tuesday admitted before a Federal High Court in Lagos that he was investigated by the Economic and Financial Crimes Commission (EFCC) for being privy to illicit transfer of funds. Obanikoro made the statement while giving evidence in the criminal trial of the immediate-past Governor of Ekiti, Ayodele Fayose, facing charges of an alleged N6.9billion fraud. 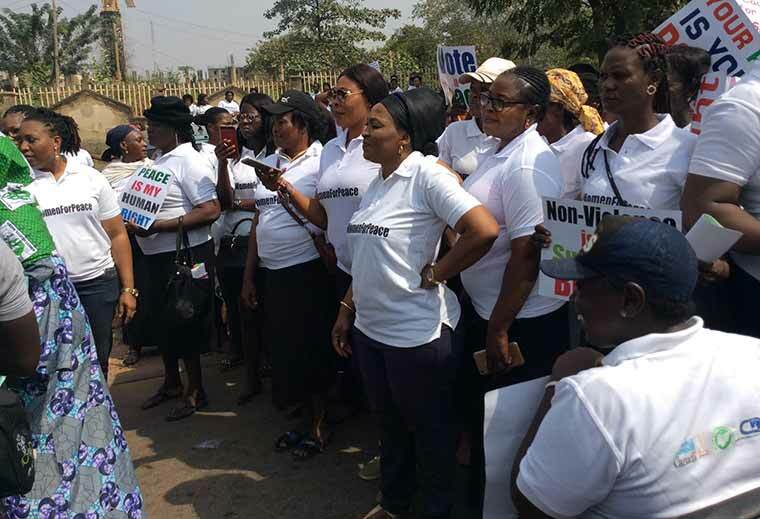 A coalition of women numbering over 500 on Tuesday staged a protest at the headquarters of the Independent National Electoral Commission in Abuja demanding that the forthcoming elections should be devoid of any form of electoral irregularities. They also used the occasion to call on other political gladiators to shun violence during the forthcoming elections. The Speaker of the Lagos State House of Assembly, Mudashiru Obasa, has challenged Governor Akinwunmi Ambode and other members of the executive arm to prove that lawmakers had been receiving N800 million monthly since 2015. Obasa said this on Tuesday during the governor’s 2019 budget presentation ceremony inside the legislative chamber. Obasa accused the executive arm of keeping silent, in the wake of the disagreement between the lawmakers and them over budget matters, while a section of the media ”misinformed the public about the lawmakers’ expenditure”.